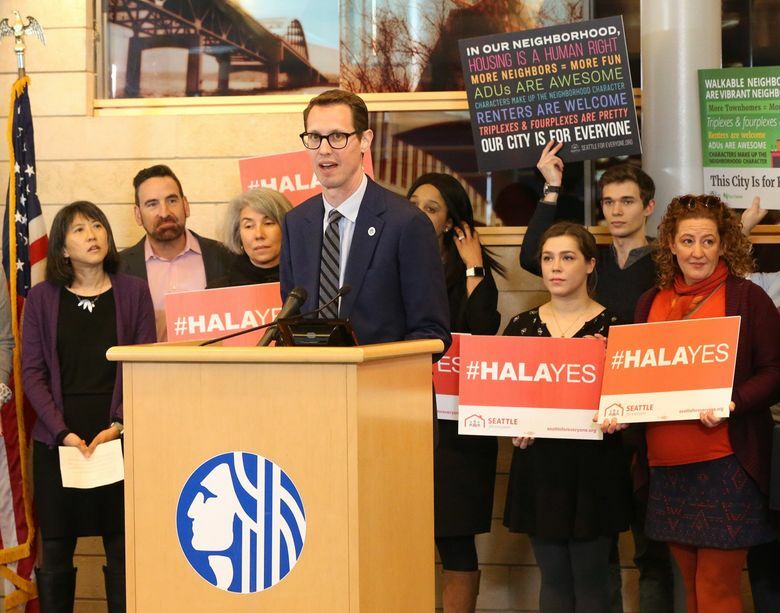 Seattle’s plan for denser development and affordable-housing requirements in more than two dozen neighborhoods cleared a key hurdle Monday as City Council members voted unanimously in a special committee to advance the long-awaited legislation. The tally was 8-0, with Councilmember Mike O’Brien absent. The council’s final vote on the plan has been set for March 18. The plan would upzone blocks across the city where apartments and commercial structures are already permitted, including in the urban cores of 27 neighborhoods. It also would allow denser housing on about 6 percent of lots where new construction now is reserved exclusively for single-family houses, with the aim of locating more people near transit hubs. At the same time, the plan would trigger the city’s Mandatory Housing Affordability policy, which requires developers to support affordable housing, either by building some rent-restricted apartments in their projects or by paying into a city fund. Proponents say the plan would harness Seattle’s growth to produce thousands of units of low-income housing, while critics have raised concerns about the upzones crowding their neighborhoods and exacerbating displacement. On some blocks, developers would be able to build two houses on a lot, up from one. On other blocks, they would be able to build one or several floors taller. On still other blocks, such as those around the Northgate light-rail station set to open in 2021, they would be able to build much taller. The plan would require developers to devote 5 percent to 11 percent of their projects to l0w-income apartments or pay $5 to $32.75 per square foot in fees, depending on project location. It was initially proposed under then-Mayor Ed Murray. Wallingford resident Fay Frank urged the council to ensure that the affordable apartments built with developer fees be sited in the same neighborhoods as the market-rate projects. “Failure to include such a provision will result in gentrified and segregated neighborhoods,” Fay said. District-based Councilmembers Lisa Herbold, Johnson and O’Brien have sought to scale back the upzones on certain blocks of single-family houses in West Seattle Junction, Wallingford, Crown Hill and some other areas, arguing milder changes would be better received by existing residents there. Councilmembers M. Lorena González and Teresa Mosqueda, who represent the city at large, have pushed back, arguing those amendments could cause fewer affordable and market-rate apartments to be constructed. Council staffers estimated the amendments would cost the city several dozen affordable apartments over the next 10 years. On Monday, the Wallingford amendments were mostly shelved, while the West Seattle Junction and Crown Hill amendments passed in divided votes. Apartments were allowed everywhere in the city many decades ago, Mosqueda pointed out in arguing against the smaller-scale upzones. The council members already have agreed to remove from the plan blocks in Mount Baker and Ravenna-Cowen Park that are part of recently designated historic districts. There also was tense debate Monday about including in the plan a so-called “claw-back” clause, championed by Herbold, expressing an intent to try to stop developers from taking advantage of the upzones in the event that a lawsuit nixes the Mandatory Housing Affordability requirements. Mosqueda objected to the clause, saying she wouldn’t want to eliminate upzones that would chip away at residential segregation in Seattle, where patterns were set decades ago by redlining and by racist neighborhood covenants. New apartments were once allowed everywhere in the city but were banned on many blocks, she noted. But Herbold said the main reason for the upzones has always been to produce affordable housing. That was the so-called “grand bargain” that Murray touted back in 2015, when he backed the policy. Cities imposing such requirements on developers provide those developers with additional building capacity, per state law. Herbold’s claw-back clause passed 5-3. Small-business owners and their supporters have been pleading with the council to remove University Way Northeast from the plan, saying upzones on the quirky strip known as The Ave would lead to displacement. They planned to rally at a brewery Monday night. Mandatory Housing Affordability upzones were adopted in 2017 for the University District (except for The Ave), downtown, Lower Queen Anne, the Chinatown International District and parts of the Central District.